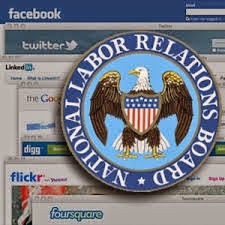 The National Labor Relations Board continues to focus on employer social media policies and employee discipline for online activity. In a ruling this week involving Triple Play Sports Bar & Grill, the Board concluded that Triple Play unlawfully fired two employees for their response to a co-worker's Facebook post. One of these employees had only responded to the post by clicking the Facebook “like” option on the post. The Facebook post at issue related to the employer paying taxes, and the Board concluded the exchange about the post, including the “like” response, was a protected group discussion about a term or condition of employment. In addition, the Board found that the employer's social media policy was unreasonably restrictive because it prohibited "inappropriate discussions about the company." As we’ve discussed in numerous other posts, non-management employees have a protected right under labor law to engage in group discussion and activity to try to better their terms of employment. You can read more below about the Triple Play case and how to stay on the right side of the National Labor Relations Board. And, speaking of Facebook, anyone familiar with the social media site is aware of the viral ALS ice bucket challenge. While the challenge has been an enormous fundraising success, check out the link below for a list of things employers should consider before hosting or approving a group workplace challenge.